You must be a member of the Dubai Runners Group to attend this activity. Would you like to join this group? Event overview: 3 Emirates Run is a fun run which starts from Al Mamzar Park in Dubai, is mostly run in Sharjah and finishes at Ajman Beach Hotel, Ajman. 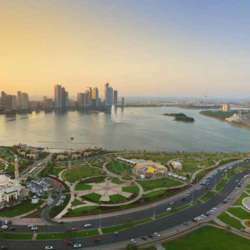 The panoramic route mostly runs along Arabian Gulf passing through popular tourist attractions of Sharjah, witnessing beautiful cultural monuments. Runners have the option to do approx. 10, 26 or 32k and 42k. Post run shower facility and breakfast is hosted at Ajman Beach Hotel. Frequent drink breaks, taking selfies and group pictures are encouraged, running faster is discouraged. Warning: If you try to run faster than your group leader, you risk being disqualified and driven straight to Hotel kitchen. Optional: 75 AED buffet Breakfast in Ajman Hotel after the RUN. Souvenier: All Finishers will get Medal after the race.